3D projection has been available in various forms for a very long time. The first mainstream 3D films made their debut during the 1950s. People at the time were convinced that 3D was the Future of Cinema. Films like Bwana Devil, Man in the Dark, House of Wax, and It Came from Outer Space thrilled audiences with this new technology. Despite a strong push, 3D didn't stick. The few 3D theaters that existed had a hard time with the expensive, complex equipment. Small mistakes could send the two-projector system out of synchronization and destroy the effect. Audiences were dissatisfied with the lackluster image quality and poor viewing conditions. For a number of years, 3D lay dormant. 3D made a brief comeback in the 1980s. This time the technology was a little better--theaters were able to show 3D with a single projector instead of two. This greatly reduced the occurrence of synchronization errors though an improper repair splice by a projectionist could still cause the movie to lose synch. This period also saw the birth of IMAX 3D. For a few years, 3D enjoyed a healthy resurgence and people were again convinced that it was here to stay. But with content like Jaws 3-D, Friday the 13th Part 3, and Amityville 3-D, audiences soon tired of the gimmick and the craze faded away. Now, 3D has made yet another comeback with films such as The Polar Express, Coraline, Monsters vs. Aliens, and (of course) Avatar. This time around, there are several key differences which indicate that 3D might be here for good. With the advent of digital cinema, synchronization and timing issues have been eliminated. Decreases in the cost and complexity of cinema projection equipment have made it possible for 3D systems to be installed in many more theaters. And filmmakers are learning how to work with 3D, leaving behind the gimmicky effects of the previous generations in favor of more immersive, integral applications of depth. Perhaps most importantly, it is now much easier to bring the 3D experience into the home. With active LCD shutter glasses, a compatible display, and a powerful enough computer, we are at the point where movies and video gaming can be seen in high quality 3D that closely approximates the commercial theater experience. Blu-ray players are on the way which will deliver full 1080p movies in 3D to TVs and projectors capable of diplaying them. 3D has been around a long time and has fallen flat before, so an assertion like "3D is here to stay" is not to be made without some consideration. With the recent technological advances in both cinema and home 3D projection, however, the stakes are higher than ever. In a nutshell, 3D technologies use two overlapping images to increase the viewer's perception of depth. One image is for the right eye, the other for the left eye. Content is filmed using a specialty camera system with two lenses which are separated horizontally, much in the way your eyes see two slightly different images. This creates the impression of depth, making the image appear to extend farther back from the surface of the screen and in some cases to pop off the screen towards the viewer. There are several competing implementations of 3D technology, but they all accomplish the same objective: they show a different image to each eye. This is achieved through the use of different types of glasses which selectively show different parts of the picture to your left and right eyes. What differs among the methods in use is the way the two images are created and the way the glasses function to separate the images. So what about glasses-less 3D TVs? Some companies claim they have that techno in store, from a flat screen. One easy way to generate 3D that has been done, is to use a fast rotating screen, and as it turns display different pixels for that 3D position. Another fantastic article. Thanks for keeping us ahead of the curve again. When special glasses are no longer required, I'll be interested. Wow you did your homework VERY well. I'm into the 3D photogrphy for a long time and still I learned some things about tech stuff from yur review. I still think 3D is a fad, just like before. People will tire of it, particularly if the 3D films are no better than what has already been produced. Until a system emerges that does not need glasses I do not see it being anymore than a novelty, although the adolescent gaming crowd will probably like it. As someone who has been working on a 3D film for the past year now and has experienced looking at the same material with all technologies (except for Interference3D), I can tell you that a good pair of shutter glasses is the best way to go. I am sensitive to 3D cross-talk and the shutter glasses eliminate this completely for a crisper / cleaner looking image. Another advantage is that you do not have to keep your head on a level plane, so if you wanted to lay down on the couch with your head cocked sideway, shutter glasses would still work as intended. Polarized glasses do not stand up well to this. Hopefully shutter glasses win the format war and will be mass produced making them much more affordable than they currently are. well i think that it will take a long period before we see broadcasting in 3d although in korea this technology is here experimentally of course! !so its difficult for me who bought an hdtv this summer to participate in this even if this is 2-3 years ahead! !without the display that is capable of 3d you can only dream of 3d movies!does anyone know if there is a possibility for a top video box lets say to convert hdtv to 3d ready?? ?of course not the 60hz but the 120hz or 200 hz ones...would that be possible! !from the other side here in grece where i live we will have the h.264 in a couple of months so i think the 3d broadcating about a century ahead!!! Because "3D Vision" glasses are another $200 on top of the cost of the projector, is it possible ProjectorCentral might consider a combo/package/bundle price where a person could buy say the new ViewSonic 3D projector + Nividia 3D Vision for a package price of around $500? I don't know about the rest of you but I am ALL about 3D! 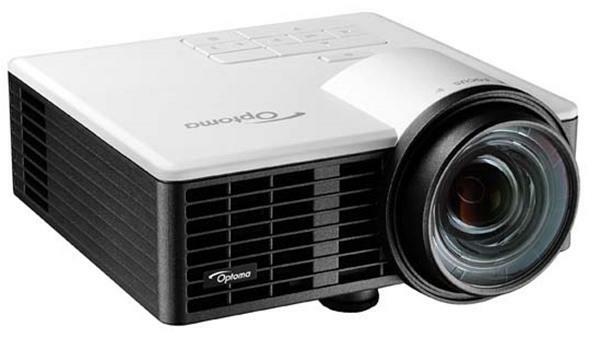 If anyone on here could help me, my email is kraftmacincheese@yahoo.com I have been scowering reviews and the like in the search for a 3D projector with the crispest video that 3D projectors can offer. I am going to be throwing a distance of about 10 feet and trying to fill up a 110" screen as much as possible in a 16:9 or similar ratio. I have my eyes on the Epson 8500ub because of the awesome 200,000:1 contrast however it does not have 3D capabilities. So can anyone help me with this. I am trying to find the absolute BEST 3D projector on the market that I can get for around 3000 or so. However I am afraid that the image won't be crisp for movies and games like on one that has a contrast such as the Epson. I am a noob to projection and all of that but am computer literate so you don't have to speak slowly lol :P Thanks everyone. The current round of 3D hype will be dead inside of 24 to 36 months.... and will be resurrected some time later again... and again... and again. In the 3D race, seems like the LCD/Plasma TVs are a little faster than projectors. Please correct me if I am wrong. Some of the TVs such as Samsung already supports 3D BlueRay directly (i.e. supports HDMI 1.4 format). Most data/home projectors only support HDMI 1.3 (1080P but not 3D). HDMI 1.4 is a relatively new standard. Second problem is that it seems that only DLP projectors can support 3D projection. LCD based projectors cannot refresh at 120Hz. So quite a number of brands of projectors will not be able to get into the bandwagon so quickly. For those looking for 3D experience using a projector and at 1080p, I guess the projectors will only be available some time later this year. I'm curious about one other thing. Isn't the end user dependent on the kind of coding that appears on, for instance, a Blu-Ray disk? Will these disks contain all the various encoding schemes, or what? Will I have to shop carefully, noting the kind of technology present on a specific disk before I buy it? If so, the media producers can quickly determine what standards will be weeded out, and buying anything now is premature. Just like VHS and Betamax all over again. So, if my projector refreshes at 120 Hz already, what is the prognosis for an interface box to decode Blu-ray 3D signals interlaced at 60 Hz for left and right eyes and providing the synchronization signal for the shutter glasses? Glasses-less 3D will never happen with current displays or projectors. In order for 3D to work, your right eye and your left eye have to see different images. If you shift a few inches to the right on your couch, how could your left eye not see what your right eye had been seeing? Until there are non-static holographic displays (there aren't and no one is working on them) the laws of physics make a glassesless 3D technology completely impossible. This is not exactly true. Hitachi as come up with a way for you to see 3D with out the glasses. It is called parallax viewing. While this format is a year or two away and is only available in flat panels we will eventually see 3D with out glasses. Bob, "Glasses-less 3D will never happen" check out [sales link deleted] and what about the 3D Nintendo DS? Anyway, i dont mind the RealD glasses which will go with my realD projector next year... i hate sgutter glasses tho, expensive and you can see the flickering..
what exactly do the 3D glasses given out at the movie theaters do? does anyone see a future of 3D movies without the glasses? is it likely that the glasses-less 3D showing technology will ever become commercialized enough to be used as widely as regular 2D tvs that most ppl have in their homes? What is the diference: 3 D READY AND 3D? Ex. : Optoma D33 and D66. Whych one is abble to project 3D movies riht now?